In this section, we will cover some of the basic things you need to understand in order to use FRED. The first thing to understand is the coordinate system. Basically this is the same as the cartesian coordinate system you may remember from maths lessons. As in the graphs you used to draw back then, X is the distance across while Y is the distance up. Since we're dealing with 3 dimensions, we also have Z which is the distance into the screen. As is usually the case, a picture is worth a thousand words. As you can see, the game draws a line to symbolise anything which doesn't have a Y coordinate of 0. In all cases, coordinates are in metres from 0,0,0. You may have noticed the different coloured Vipers in that picture. 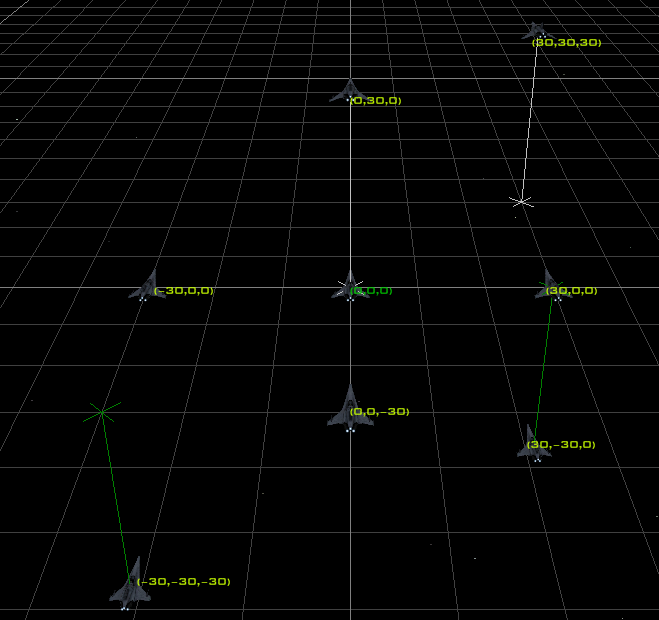 In FRED you have the ability to pick multiple ships at one time in order to change them. One way to do this is by hold down the Shift Key and selecting them in order. You can also drag a box around the the ships you want with your mouse or simply use a list accessible from the Toolbar. Unfortunately FRED has a bad habit of not being able to decide what it should call this ability. Sometimes you'll see FRED refer to marking multiple ships while sometimes you'll see it refer to selecting several. The names are rather unimportant in the end as long as you remember this. When you select (or mark) multiple ships one ship will be marked in green while the others will be yellow. Unselected ships will remain white. For an example, look at this picture. Alpha 1 is the ship marked in green and therefore is the leader of the selection. Whenever FRED needs to fill in data about the ships you have selected, it will fill it in based on whatever settings the green ship has. If you change the data (Cargo, AI class, etc) all yellow or green ships will be altered. If you rotate or move ships, all coloured ships will be moved. Most of the controls you'll use in FRED are on the numeric keypad. Commands in brackets are what will happen when using Viewpoint -> Current Ship rather than Viewpoint -> Camera.